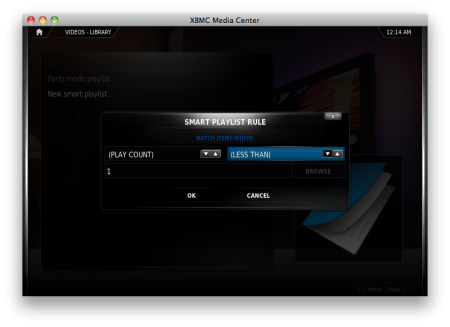 There are several ways you could accomplish this, but the easiest way to do this is to use the Smart Playlists functionality in XBMC. Smart playlists are playlists which use a set of rules to limit the results from the databases. This way you can limit the select items to match a set of predefined criteria which you have set. In this example we will create a TV channel, which will be built using a combination of smart playlists. A working installation of XBMC on your chosen platform. 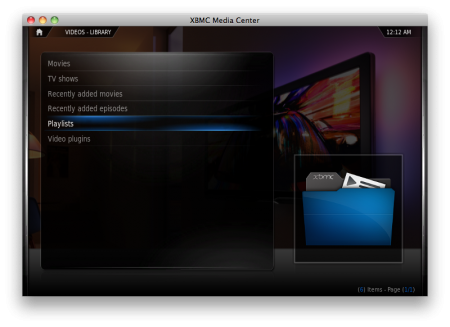 Content scanned into your library within XBMC. A list of your favourite tv shows. About 30mins to get it all working. 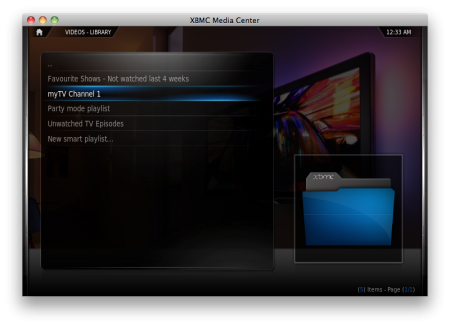 For this example, I will be using the default XBMC skin, Confluence, however this should work with any skin. 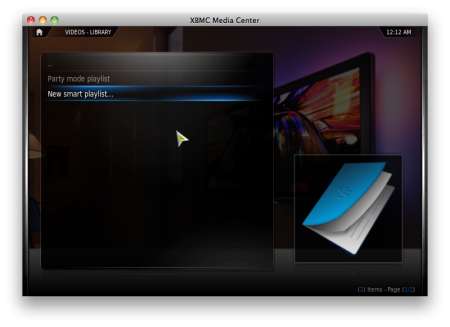 First up we will create some smart playlists. A smart playlist for all unwatched tv episodes. A smart playlist for all of our favourite shows that haven’t been watched in the past 4 weeks. A smart playlist that combines all of the above. 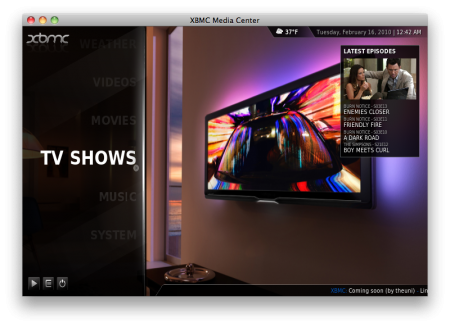 Test your myTV Channel 1 works. 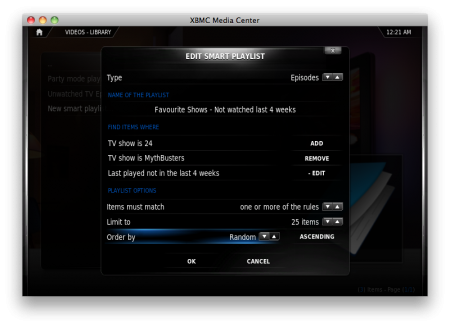 We now need to combine the two smart playlists we have just created into a single smart playlist that will be used for the virtual TV channel. 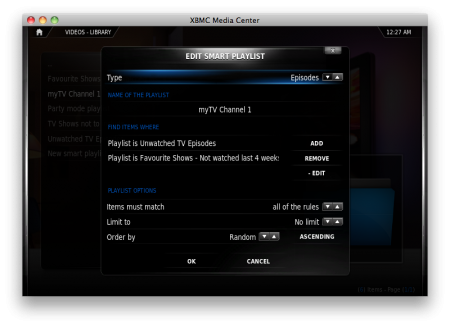 Create a new smart playlist and make sure it looks like the following example and call it “myTV Channel 1″. Make sure that you set “Items must match all of the rules”. 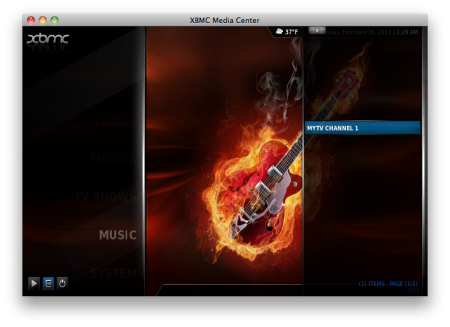 Checkout your new “myTV Channel 1″ playlist to make sure it works. It should list a selection of shows. OK so we now have a smart playlist we can use for a channel. It’s a start, however its not easily accessible for your typical user. We could add it as a favourite, its better but its still not great. How about we make it accessible from the main Confluence home screen – you don’t get much more user friendly than that! To do this you are going to have to get your hands a little dirty and add a few lines to the skin’s xml file. Depending on your platform linux / osx / atv / windows the location of the files you need to edit will vary. This section will be added soon! Paul, you rock. Excellent tutorial and post. 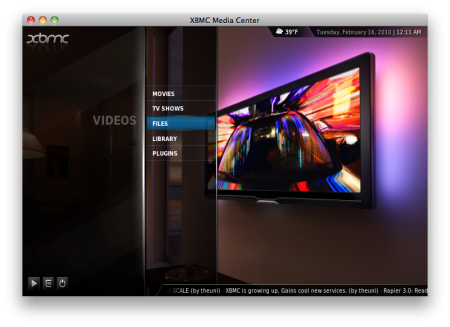 I have read the XBMC posts here and I have learned more about ‘using’ XBMC from your posts than I have reading thousands of pages on XBMC’s forum. Any update on this? Great guide by the way, thanks! Anyway of getting this tutorial for the latest release. I can’t follow along since this seems to be for a previous release. Sure, I’ll take a look at getting this updated in the next few days. Is there any bit in particular you were having issues with? I have created a bunch of smart playlists but can only play one file at a time. When the next one is due to play or if I click next I get an error message saying cant find a next item to play. However if I manually click on the next item it plays fine. Any ideas? I’m using the newest nightly build so possibly this could be broken in my version.